Looking carefully at Jesus' words above, He makes a couple of promises. One is very comforting, for He has overcome the world! Yet there is another, integral to the first: He promises us trouble in this world. So why am I surprised every time trouble intrudes into my ordered life? 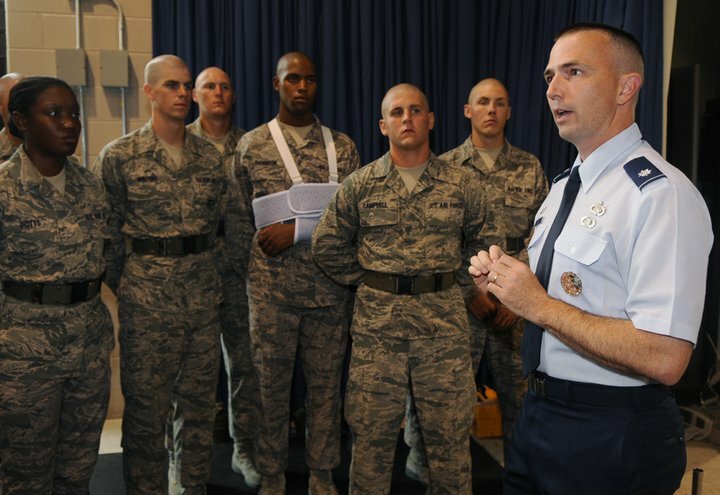 As my long-time readers are aware, I commanded the United States Air Force Honor Guard from 2009 to 2011. It was, as my predecessor foretold, "the ride of my life," full of heady experiences and proud moments. It also featured the hardest span of my military career. For my final six months, a series of disciplinary issues involving my very young enlisted population rocked my happy world. Suddenly the gaze of the Air Force's senior leaders--who expected their "elite" units to behave in an elite fashion--turned on the Honor Guard in a blistering way (think of the unblinking Eye of Sauron from the Lord of the Rings and you'll get the sensation). I was left fighting for my job. I lived in mortal fear of the weekend bad-news phone calls, which I received with alarming regularity. How would I explain the latest incident, over which I seemed to have virtually no control? It was nerve-wracking, humbling, exhausting. To this day I'm still not certain what made January-July 2011 so much different than the previous 18 months in command, which had been relatively quiet from a discipline standpoint. What I do know is that I felt mercilessly plundered of my self-esteem and my reputation--both of which I suddenly found I valued much more than I'd previously been aware. I was also made vividly aware of my own severe limitations. I could do many things as commander, but couldn't promise I could stop the madness. Every day there were about 250 young men and women barely out of high school, any one of whom might be plotting my demise (likely beginning with simple words like, "Hey, dude, I've got an awesome idea!"). It was just awful. Still, the one comfort I discovered was in embracing the loving discipline of my Father, who drove me back to my knees--on which I seem to spend precious little time when things are going smoothly. God's commitment to me is such that He guarantees trial. What good is an arrogant, worldly, successful servant? I truly ought to have expected this season, knowing that "He who began a good work in you will carry it on to completion until the day of Christ Jesus." Too often our struggle with prayer is that we focus on the wrong things. We focus on praying better instead of focusing on knowing better the one to whom we pray. And we focus on our need of discipline rather than our need for God. So many of us want to pray more but our lives seem too disordered. But God wants us to see that our messy, chaotic lives can be an impetus to pray instead of an obstacle to prayer. You don't need discipline nearly as much as you need a broken heart and faith. You don't need an ordered life to enable prayer; you need a messy life to drive you to prayer. You don't need to have everything together to pray. You need to know you're not together so you will pray. You don't need your life to be fixed before you pray. You need a broken heart. You need to realize "Tomorrow is another day that I need God. I need to know Him. I need forgiveness. I need help. I need protection. I need deliverance. I need patience. I need courage." And because of all these needs, you realize you need prayer. If you know you are needy and believe that God helps the needy, you will pray. This is why we are able to: "Consider it pure joy, my brothers and sisters, whenever you face trials of many kinds, because you know that the testing of your faith produces perseverance. Let perseverance finish its work so that you may be mature and complete, not lacking anything." (James 1:2-4) Because frankly, we need our our lives to get messy, and we need to be hearts broken once in a while. My hope is not in avoiding trouble. My hope is in Him who has overcome the world. Thanks for linking. I needed Kevin DeYoung's words too. Brilliant stuff! A great reminder of the "red letters", in Jesus' own words, message. It is quite easy to forget that the full Christian experience has to involve encounters of hardship, and letting Jesus see us through. Amen!!! I believe one of the greatest deceptions that the enemy pulls over on believers once they are saved is that all of their problems will cease and life will be smooth sailing from there on. It's a dangerous philosophy that leads to disillusionment and despair when the trials of life remain--and often even increase--and the new Christian's faith falls apart because they think God let them down. Amen! In my spiritual immaturity and blindness, I thought that if God really loved me that I wouldn't be going through any hard times. Now I know differently and it has changed my perspective and allowed me to handle difficulties in a healthier way by accepting that Jesus is right there in the midst of the adversity and as long as I keep my eyes on Him and am securely based in the truth of His Word that together we can handle anything. The Holy Spirit has also been teaching me so much about how my wrong beliefs and thoughts have created the illnesses in my body and as I follow His promptings, my body and mind are being healed and restored to me. Thanks for the opportunity of sharing Ray. Mourning a suicide, If inquired of God to introduce me to someone else in the family of God who had experienced something similiar and He introduced me to Kay Author as I continue to work through her devotionals, my ability to see clearly becomes more and more and more defined. The world and its people look totally different. Each day is its own adventure as I walk with Jesus and He shows me so many new things. Wow, this is good! If I had to define prayer it would be 'utter dependence on Him' in all things at all times. It wasn't very long ago that I prayed for a greater desire to pray. Of course I wanted my prayer delivered, after supper, with a pretty bow, on my not so busy day. Thank God for His wisdom to override my flesh! Yes, it gets rough at times, but that is when we pray best because we depend on Him most dearly! Thank you for sharing! I wonder at the humble appreciative nature that comes from finding grace under pressure. From the understanding that comes from or through suffering. For some without knowing the alternate we have no gauge to realize just how bad it can be. I really like your scripture addition to bring light to your difficulty and in making sense of it. Our father knows all even before you experienced it. There is a great purpose and presence context that tells me there is hope and for that reason alone we must not forget. Let me say this is a lesson that was not easily learned. Something happened today and my first thought was to ask the Lord for direction. Where do we turn when times are tough - is it automatic or natural? Thanks and God Bless!